The amount in picture is for 5-6 persons but the below recipe is for 2. This is just something I put together with the leftover ingredients for CNY eve reunion steamboat. And it was so awesome not to be shared! Do note that this is Thai inspired and not authentic because I don't have specific ingredients and a claypot. 1. Soak glass noodles in water for about 15 minutes till they are soft. 2. Prepare marinade by mixing chicken broth, light soy sauce, dark soy sauce, oyster sauce, sesame oil and sugar in a bowl. 3. Pour out water from glass noodles. 4. Marinade glass noodles and prawns with the sauce for half an hour. It's up to you if you want to peel the prawns or not. 5. Pound together black peppercorns, garlic cloves, cilantro roots and ginger slices. 6. Start by heating up normal cooking oil then stir fry the pounded ingredients till fragrant. 7. 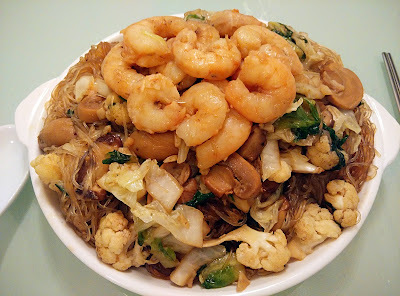 Pour in the marinated glass noodles and prawns and stir fry for 15 minutes till prawns are cooked. The marinade may dry up so you can add water occasionally. 8. In between, add vegetables of your choice or choose to leave it. And it's done...so simple right?